Indianapolis, Ind. 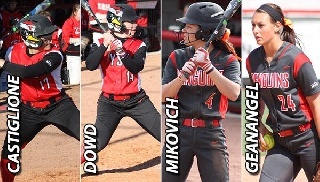 -- Senior Miranda Castiglione and sophomore Cali Mikovich were named All-Horizon League First-Team while junior Sarah Dowd earned second-team honors and Paige Geanangel was named to the All-Freshman Team, the Horizon League announced on Tuesday. Castiglione, the 2014 Horizon League Co-Player of the Year and a first-team choice in 2015, is the first player in school history to earn first-team all-league honors three times. This is also the third all-league award for Dowd, who was also named to the second-team in 2014 and 2015. Castiglione, who finished in the top four in 11 different Horizon League statistical categories, led the league in doubles (16), total bases (114) and runs scored (53) and finished second in batting average (.439), slugging percentage (.820), on-base percentage (.544), runs batted in (47). She was also tied for third in home runs (11) and was fourth in hits (61) and stolen bases (22). Castiglione, who set the YSU single-season runs and runs batted in records in 2016, batted .411 with seven home runs and 24 runs batted in against Horizon League oppoents. Mikovich, who was named to the All-Freshman Team in 2015, broke the YSU single-season home run record with 12 and batted .389 with 39 runs batted in, 50 runs scored and 14 stolen bases. Mikovich tied for the Horizon League lead with 65 hits, ranked second home runs, 112 total bases and runs scored, third with a .389 batting average and a .671 slugging percentage. Against the league, Mikovich batted. 395 with seven homers and 15 RBIs. Dowd batted .307 with 11 home runs and drove in 35 runs while scoring 40 times. She became the first player in school history with 10 or more home runs in multiple seasons and the YSU's career leader with four grand slams. Dowd also finished tied for third in the league in home runs, tied for fourth in runs scored and ninth in RBIs. Against the league, Dowd batted .313 and blasted six home runs. Geanangel led the Penguins and ranked third in the Horizon League in victories with 16. She became the first YSU freshman pitcher since 2003 to record 16 wins. She went 9-5 and threw two shutouts in league play.